Encourage more women to apply for trainee driver roles, working towards 40% female trainee train drivers by 2021. Offer 140 apprenticeships across a wide range of roles, from engineering and driving, to digital marketing and customer service. 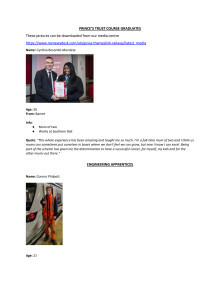 Help over 40 young people from disadvantaged backgrounds into full-time employment through the ‘Get Into Railways’ Scheme in partnership with The Prince’s Trust. In the UK, just five per cent of Britain’s 19,000 train drivers are women, but GTR is committed to changing this and has already taken steps to address the imbalance. Last year, 30% of Southern’s trainee driver roles were taken up by women, up from 18% in 2017. In addition, a class of new trainee drivers on both Great Northern and Southern had a 50:50 gender split in 2018. GTR now has over 2,000 qualified drivers across the Southern, Great Northern, Thameslink and Gatwick Express network, the first train operating company (TOC) ever to reach this milestone. Overall, GTR has the biggest training and recruitment programme in rail in the UK with over 700 new recruits introduced across the organisation last year and over 400 existing employees promoted to new roles. Driver recruitment is also on the rise - 700 new drivers have been trained since 2015, with a further 270 currently in training. GTR’s overarching target is that by 2021, at least 40% of applicants for train driver roles will be female. In order to attract more women to the role, GTR has attended careers fairs across the UK to discuss the opportunities available with younger people as they embark on career choices. Recruitment of more women to the role has also been helped by all female assessment centres for trainee drivers, and a scheme which sees new female recruits paired up with another woman in the company to create female-focused support networks. In addition, GTR has posted job adverts on forums such as Mumsnet, and a number of GTR employees work as mentors with The Girls’ Network to help young women understand the different career opportunities open to them. The driver recruitment and training drive is part of GTR’s modernisation programme to address growing passenger numbers that have doubled in as little as 12 years on some parts of its network. 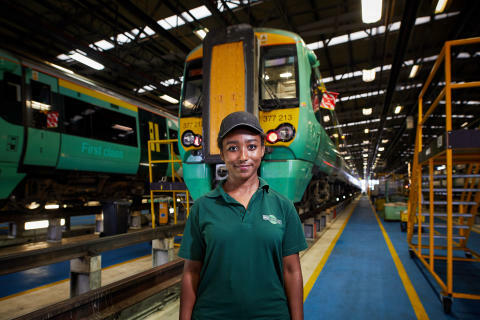 As well as providing more opportunities for women, GTR is aiming to offer 140 apprenticeships places this year to help young people develop their career opportunities on the railways. A third of apprenticeships were filled by women in 2018 with the aim of attracting even more women to programmes across the board in 2019. GTR has created a number of new roles to help reach this goal, including a new Apprentice Station Manager role on Southern Railway and Gatwick Express. The apprenticeships will also be open to existing GTR employees as a means of development for their career. The launch of the recruitment campaign ties in with the Government’s 12th annual National Apprenticeship Week which runs from 4 to 8 March 2019. As the UK's largest rail franchise, covering 24% of the country's train journeys every day, GTR currently hires more engineering apprentices than any other train operating company (TOC) in the UK. Ten apprentices joined the organisation in 2018 and a further 15 are set to be recruited this year. Most apprentices join the scheme after completing A-Levels and see an apprenticeship as an alternative to going to university. All apprenticeships at GTR combine college study with hands-on experience, resulting in UK-recognised qualifications. GTR has released two commercials produced by PR Eye to launch its 2019 Engineering Apprenticeship recruitment campaign, aimed at showcasing the wealth of possibilities open to engineering apprentices. The commercials will show on screens at Victoria Station and across the network. This year will see GTR train over 40 young people from disadvantaged backgrounds to help them into full-time employment. The Get Into Railway scheme run in partnership with The Prince’s Trust sees a team of 100 GTR staff members orchestrate three intakes per year, often creating specific roles for participants following their graduation. To date, 165 young people have taken part in the programme over the course of the seven-year partnership, with the majority securing a customer service role across Southern, Great Northern, Gatwick Express and Thameslink. The 18-25 year olds selected for the programme undertake a four-week course at a training centre on GTR’s network. The first two weeks is spent at the training centre followed by a two-week work placement on the network, with a graduation ceremony at the end of the course. The programme focuses on practical customer service skills development and the chance to build a strong CV. The Prince's Trust helps the young people become work-ready by developing their skills and confidence. GTR Apprenticeship: Katrina's Story from PR Eye on Vimeo. GTR Apprenticeship: Jack's Story from PR Eye on Vimeo.